Webcam is a simple camera app that lets us easily capture any photograph and live videos on PC. It makes our life more convenient and colorful as we can use it to chat with others online, make video tutorials, hold webinars, etc. Due to the wide use of webcam software, there will always be a time when we need to record the webcam videos for further uses. Luckily, there are a lot of webcam recording tools that could help us capture any webcam video with ease. To make it even easier for you, in this review, we have created the top list of 8 best free and paid webcam recording software for Windows and Mac computer systems based on performance, user reviews, ratings, the number of downloads and popularity. Now read on to pick up your favorite webcam recorder which you wish to use according to the complexity of your requirement. As one of the best screen recording software, Joyoshare Screen Recorder is a full-featured video capture that can not only capture any webcam screen video, but also record other online videos and all desktop activities, including games, movies, webinars, lectures, online chats, streaming music, system audio, microphone sound, and more. Being different from other webcam recorders which have a complicated layout and redundant functional buttons, Joyoshare Screen Recorder introduces an intuitive user-friendly interface which makes recording webcam videos and audios extremely easy for even non-tech-savvy users. In addition, it allows you save recorded webcam videos in multiple popular formats, including HD MP4, WMV, FLV, SWF, MP3, AAC, etc. as well as mobile devices like Apple iPhone, Android, Windows Phone, without any quality loss so that you can freely share the webcam recordings with your friends or upload the videos online. Furthermore, Joyoshare Screen Recorder empowers you take screenshots of the webcam videos during recording. You can also create scheduled recording task for the webcam videos in advance if you don't want to sit in front of computer while recording. Like Joyoshare, Debut Video Capture is not a dedicated webcam recording software, but rather a screen capture that can help you capture any video on your computer apart from webcam videos. It also lets you record and save videos in various formats, including AVI, WMV, FLV, MPG, MP4 etc. Besides, it has a lot of options for customizing the video output you get from your webcam, such as webcam overlay, video color adjustments, and adding captions to videos and so much more. The best part that makes Debut Video Capture outstanding than other webcam software is that it offers the ability to capture video from any PC image source as well as USB devices like IP webcams, digital video camera and all. It also supports sharing recorded webcam videos to email as well as FTP server once the recording completes. Currently, Debut is available with free version and Pro version which is sold at $49.99. If you want to enhance the webcam videos you are recording, SplitCam could be the best assistant as it provides a large number of special effects to the video and audio sessions while you are chatting with others. It is a completely free webcam recording software that can not only add fun elements to your videos, but also act as a live video streaming software. As the name suggests, splitting is another stunning feature of SplitCam. In other words, it allows you use numerous application of webcam without showing a busy error message. Also, it offers other great features too, such as multiple video resolutions, built-in video editor, audio adjustor, etc. All these make SplitCam an amazing dedicated webcam recorder for PC. Free2X is another light weight free webcam software that specialized in capturing videos from any webcam and digital video camera. It can also be used to capture snapshots from the webcams. 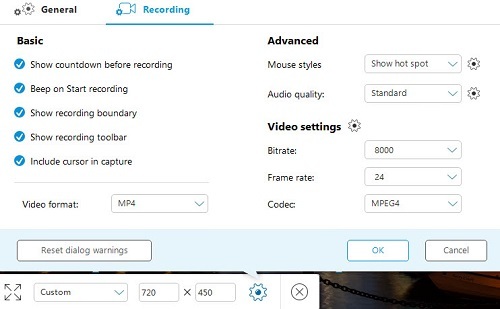 While recording the webcam videos, Free2X Webcam Recorder supports encoding the videos in many commonly used formats including MP4, AVI, and WMV. With an integral file manager, this webcam recording tool enables you manage and organize recordings easily. You can also alter camera brightness, contrast, saturation, sharpness, gamma etc. depending on your own requirements. To make it easier to control, Free2X provides custom shortcuts so that you can define the recording in regards of record, pause, stop, and snapshot. It also supports scheduled webcam recording. Namely you can set the starting and stopping time manually in advance. What's more, it also allows you record microphone sound while capturing videos from the webcams. 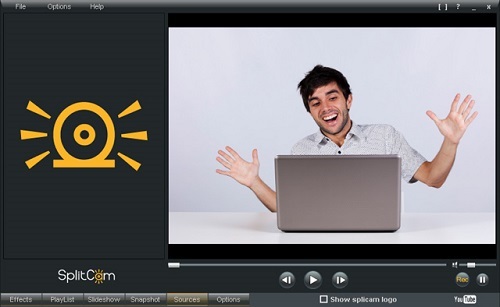 Bandicam is a fairly popular screencasting tool on Windows platform. As one of the very first developers focus on screen recording software, it provides three main modes for recording screen, including game recording mode, screen recording mode and device recording mode. Here we'll concentrate on screen recording mode. 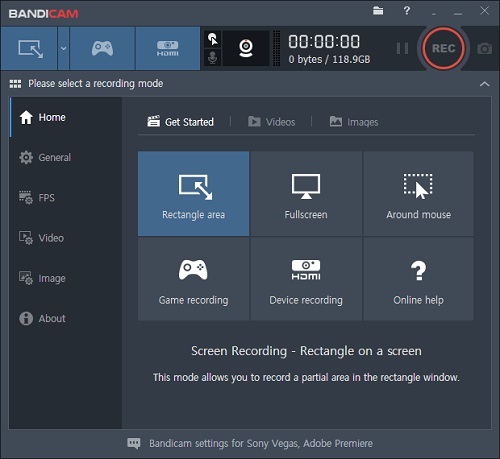 The screen recording mode of Bandicam allows you to record your computer screen, including webcams, system sounds and countless applications. Under this mode, you're able to record either full screen or only a specific area of your screen. 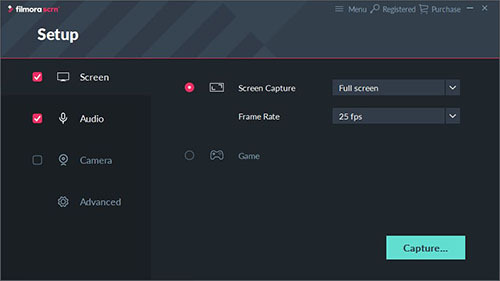 This mode is not made for high fps recordings like Game Recording Mode, but you are offered with 20 options for output video resolutions up to 4K. That means it can produce rather high video quality if your hardware is powerful enough. As a handy screen video recorder, Bandicam can save the recorded videos in AVI, MP4 and image formats with custom effects and share the recordings to YouTube or Vimeo directly. Movavi Screen Recorder is also a great and well known webcam video recording software that can be used on both Mac and Windows OS. It can help you record webinars, online tutorials, video chats, and other educational videos and save them on a computer or mobile device as you like. Once captured, you can replay the recordings and delete ads and other unwanted sections with the built-in video cutter. Besides, after the recording, the video can be converted to MP4/MOV/FLV/AVI, etc. It can also be used as an audio capture to record online radio, streaming audio and extract music from videos. You can also edit video transitions, titles, filters, crop, etc. to adjust the effects of recorded webcam videos. Upload recorded videos to YouTube, Facebook, Google Plus, etc. 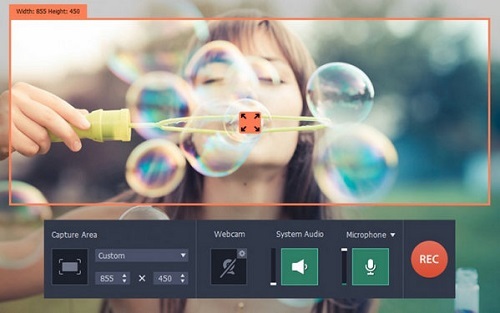 Filmora Scrn, developed by Wondershare, is another paid webcam video recorder to help you record desktop screen, webcam videos with audio simultaneously. 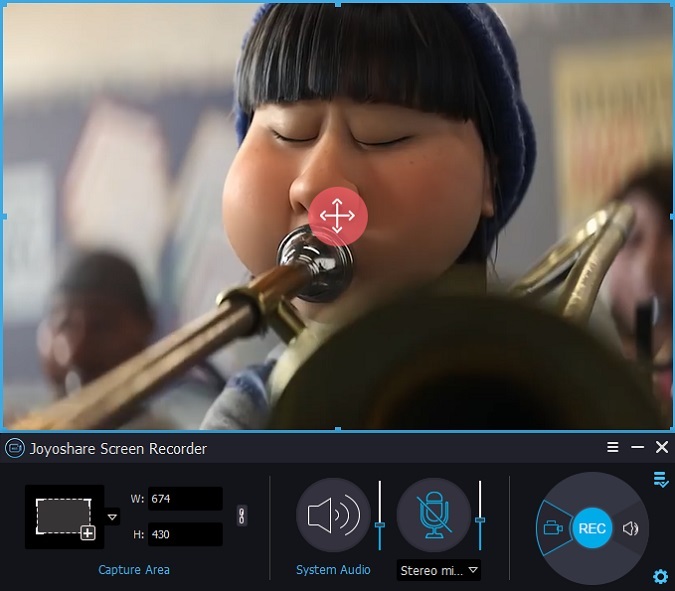 As a simple-to-use screen recorder, Filmora Scrn allows you capture and export any screen video and audio to common MP4, MOV, GIF in high quality. The best thing of Filmora Scrn is it has a powerful editing suite that makes the recorded webcams more professional with a wide range of special effects applied. You can also use it to take screenshots and capture videos from virtual camera. If you don't want to install an actual webcam software on your computer to record the videos, then Apowersoft Online Recorder could meet your needs. As a web-based free screen recorder, it's able to record all types of activities on your screen including webcams, video stream, self-demonstration, live chat and more and export the recordings to MP4, WMV, AVI, FLV, MPEG, VOB, ASF and GIF. The most impressive feature of Apowersoft Online Screen Recorder is that it allows you to record multiple webcam videos side-by-side using popular chat services, like Skype, GoToMeeting and many others. Aside from video, it can also capture audio with video at the same time. When the recording is done, you can either save the recorded video into local drive, or upload it to cloud space for free. Any idea which webcam video recorder to choose after viewing the detailed analysis of each software? To sum up, if you are looking for a dedicated free webcam recording program, Free2X and SplitCam could be the best choices as they are specialized in recording webcam videos while adding special and fun effects to the recordings with no cost. If you have low budget on paid webcam recorder, then you are suggested to go for Joyoshare Screen Recorder or Filmora Scrn. But if you have no limit on the price, Debut Video Capture or Bandicam should be a better option to test out. Anyway, no matter which program you choose, don't forget to try the free version in advance.